I am all kinds of tired this morning. It's everything I can do not to go back to bed… on this… my last full day off before the kids start their Christmas vacation. And this chronic sinusitis that I seem to have developed that likes to plague me for months at a time throughout the winter isn't helping either. But, for that, I can't complain… because my doc told me to be neti potting. And so since I'm not…. because really, water going through your sinuses is not the most pleasant thing… I can't complain. But I can mention it. So there you are. I mentioned it. I am about 15 pages of reading and a 9 page paper away from finishing my current class. It must be finished by the first of January… for that is when I start afresh with some new classes. 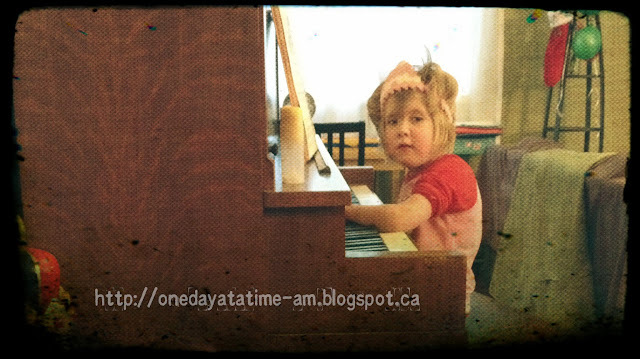 I'm wondering how that's going to go today… with being all tired and all. I'm sucking down the coffee, trying to wake up, but as you can tell by my rambling about uninteresting things and my excessive use of the "…", it is not working very well. Yikes… and I should be starting a paper today? Perhaps just the outline. 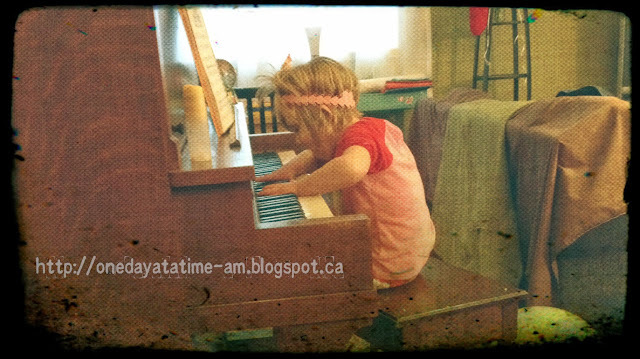 But really, I came on here today to 1) see if I could get myself motivated and 2) to share with you my daughter and her love of the piano and crowns. 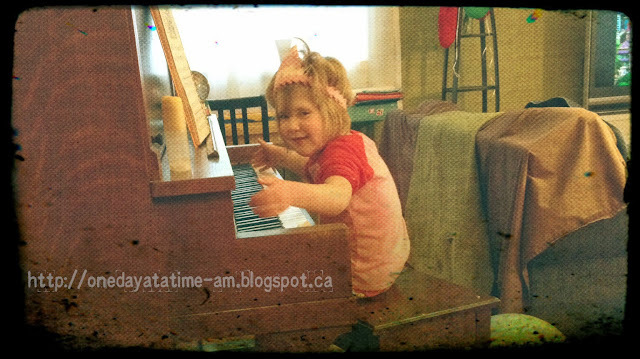 Finleigh loves to sit down at the piano and sing her songs. "OLD MACDONALD HAD A FAAAAAAARRRMMMMM. E-I-E-I-OOOOOOOOOO." My sweet little girl with the crazy hair and the love of music. Almost makes all this tiredness worth it. It DOES make it worth it. She is pretty darn adorable.